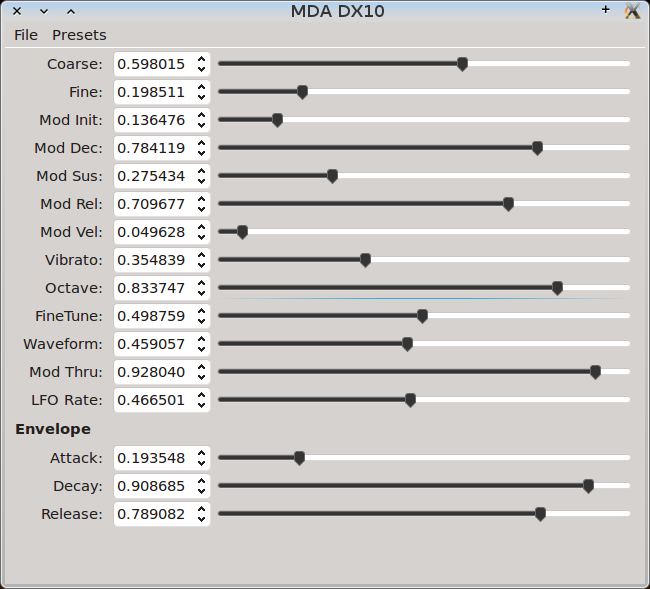 DX-10 is a polyphonic realtime VST-based synthesizer developed by Paul Kellet, and was ported to linux by David Robillard. All the parameters for sound synthesis are provided in the single UI shown above. The "Coarse" and "Fine" provide harmonics adjustments. The initial tone can be set by "Mod. Init" and the envelopes "Dec," "Sus" and "Rel." "Mod Vel" controls key velocity sensitivity. Octave and fine tuning are also included. "Waveform" provides a spectrum from a sine/square-type wave to a saw-type wave. "Mod Thru" further modifies the waveform. The LFO parameter adjusts the speed of the "Vibrato" depth. The amplitude envelope parameters (attack, decay and release) are provided under the "Envelope" near the bottom. Presets: DX10Demos01 This tarball contains the patches in the demos (except E.Piano, which is one of several presets included in the app itself). Each patch is a folder; just unzip the file in the hidden .lv2 folder and they will appear in the presets list when DX-10 is started.